The Code Editor is a sophisticated code editing tool which allows you to edit your themes template files and is intended for users comfortable modifying CSS and HTML. All Plans can access the User Stylesheet CSS file. Pro Plans and above can access all theme template files. You can also upload assets (files) like PDF files. Please see our Upload a PDFguide. We do not provide technical support for changes made through the Code Editor. Tap the 'Code Editor' panel in the Design editor. Read and acknowledge warning and 'Continue Anyway'. The User Stylesheet CSS file is available for all plans and will be empty by default. CSS code added to this file will override the default CSS code for your site and will remain active following an update to your theme version. All editable files for your theme will be displayed. 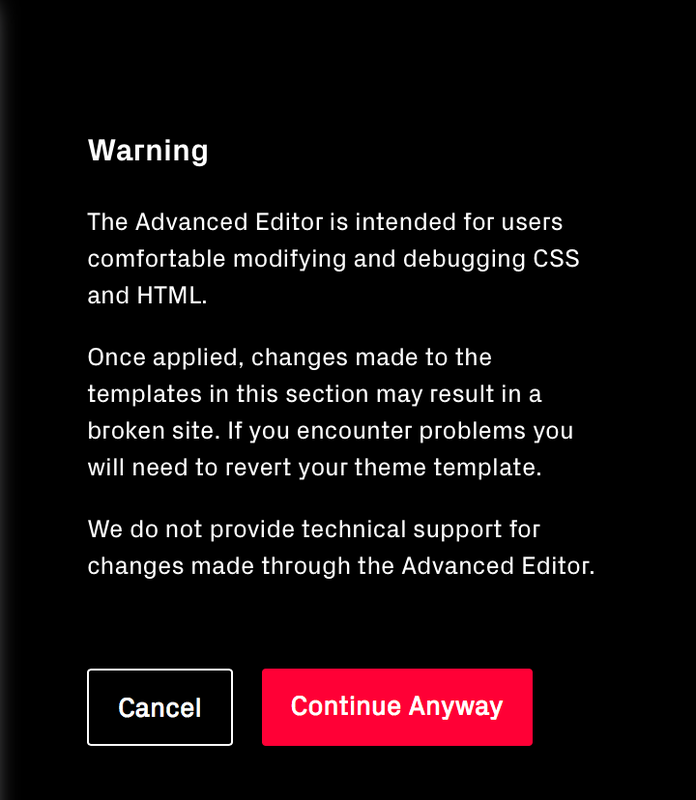 Saving edited code will stop your theme from auto-updating. There will be an option to update your theme to the latest version manually via the Design area instead.